The #1 Albums: "Johnny Cash at San Quentin"
Photographer Jim Marshall called this picture, snapped at the soundcheck before Johnny Cash’s San Quentin Prison performance in 1969, “the most ripped-off photo in the history of the world.” Now we’re doing it. In 1953, Johnny Cash wrote “Folsom Prison Blues.” Fifteen years later, on a weekday morning in January, he played a legendary concert there, which resulted in one of the most famous albums in country music history. Although At Folsom Prison stayed on the Billboard 200 for over two years, it rose no higher than #13. Its success guaranteed that Cash would eventually make another high-profile prison album. So it was that in February 1969, he went to California’s San Quentin Prison, where he had appeared in 1958. I can’t say it better than Stephen Thomas Erlewine at Allmusic.com: “No other Johnny Cash record sounds as wild as this. He sounds like an outlaw and renegade here, which is what gives it power.” Although Cash spent only one night of his life in jail (for picking flowers, an incident dramatized in his song “Starkville City Jail,” which appears on the album), to his audience of prisoners, he seems like one of them. He kids the guards, uses profanity on stage, talks about using drugs, and famously flipped off prison officials for photographer Jim Marshall. But at the same time, Cash and his entourage were conscious of where they were—in one of the most brutal prisons in America, where their safety couldn’t be guaranteed if something went wrong. Which makes the inclusion of the song “San Quentin” especially ballsy. 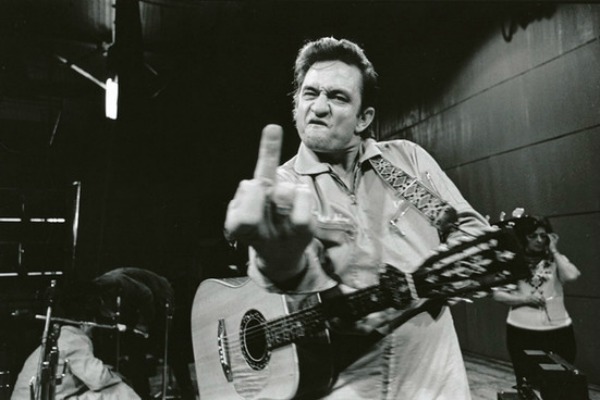 The song got such a response when Cash performed it that he immediately performed it a second time. Although I can’t find a citation, I recall Cash saying later that the energy in the hall after the second performance was such that if he’d given the word, the prisoners would have rioted. Cash’s criticism of the prison was sincere, however. He’d been performing at prisons since 1957 and would be a lifelong advocate for prisoners’ rights. “San Quentin” is not the most famous song on the album, however. That would be the Shel Silverstein novelty “A Boy Named Sue,” which rose to #2 on the Hot 100 at about the time the album was finishing its run at #1. Johnny Cash at San Quentin hit #1 on August 23, 1969, and stayed for four weeks.